It is Sunday afternoon and I have some time free again and that means Susan time. I got home about 2:45 so it is a little later than normal but I want my Susan time. I started getting ready and as my time was limited I didn’t take as long getting ready. It is amazing as it really is not about doing a better look when I take longer it is more about enjoying the experience. Kind of like eating I guess, I can take smaller bites and savor the food or bigger bites and eat faster but in the end the result is the same if that makes sense. Any way I was ready by a little after 3:30 and drove to the Starbucks by my house, I got there at 3:40 and they looked busy. I actually had to park away from the building which is rare. There were even a couple people sitting outside at the tables under the cover of the building as it was raining so I was wondering if I would get a table. As I walked in I could see 1 table open by the window. I was right they were busy. The counter in the back had 1 open chair the long table had 7 people sitting at it, the big round table had 6 and all the chairs were takes as were all the small tables except for the 1 and there were 7 people in line. I didn’t take a chance and set my computer on the only table open and then went and joined the people in line. when I finally got to the front of the line the young lady making the drinks looked over at me and asked if I wanted my normal Grande sweetened green ice tea and I said yes so, she was already making my drink before I paid. I guess that means I must come here to regular as not only do they remember my name but also what I want to drink. The lady took my order and I paid for it and by that time my drink was ready. So, there was no waiting. I sat down and got out my computer and there was still a line of 6 to 8 people and that lasted for probably 20 to 30 minutes it was a really busy rush and probably one of the busiest I have seen it here although it would eventually slow down. I did some work on my computer and wrote my blog from yesterday about going to the gun range and the Escape, it was a really fun full day for Susan. 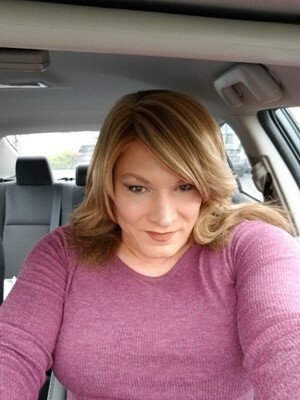 Now in that blog ai talked about my lipstick I have been wearing and how well it lasts so today I wore the same brand but a more neutral color and I did get a picture in the car before I came in. now it really is a lot of fun here when it is busy as it is great for people watching which is one of the reasons I like coming to Starbuck’s. there really is something relaxing about spending a few hours at Starbucks and catching up on things I need to do. I am just one of many people who come here and it is a fun way to spend an afternoon, way more fun than just sitting at home doing this stuff. I got my bog done and then spent some time catching up on some work I had to do, computers make life so much easier. Now there was a young lady that was at the next table and she met a man here so I really wasn’t paying attention other than she was on crutches. Anyway, it was about 5 and the man left and she was getting ready to leave so I just had to ask her about her foot and what happened. She told me she had tripped at home and thought she sprained it. I jokingly told her she should come up with a better story like she tripped saving someone before they got hit by a car and she thought that was funny. Well she left and I was back to my stuff on my computer and about 15 minutes later she came back in and came over and talked to me a little more. Seems she is looking for people for some kind of home-based business and thought I would be perfect. I talked with her a little bit and she wants to meet with me to give me more information. Any way she gave me her number and told me to let her know when I had some time and wanted to learn more about her business opportunity. Now I am not big on these type of things but it might be interesting just to do it as Susan and get the information, will have to think about this though. stayed here till they closed at 6:30 but that is where my typical Sunday night ends as I got gas yesterday so now it was just getting something to eat. I decided to go to Subway as I am trying to eat better. I went to the one not far from my house which I have gone to many times as my male self although it has been a while and they seem to have a high turnover at Subway. Thanks for reading and be sure and check out my most recent blog. Saturday and a full day of Susan, going to the gun range to shoot. It is Saturday and today is our groups day at the gun range. Now I know this is not the typical transgender thing to do but our group really does try to do mainstream things and everyday type things ad yes there are women out there that like and shoot guns just like in our group. This is also not a political thing it is just some of our members have guns and like to shoot and what better way to do that then as our female selves. Jan and Lynn have hosted this for several years and have done an awesome job and I am excited as this is the first year I have been able to make it. This does mean a long day for Susan though as I will have to leave home at 8:30 am to get there by 9:30 and we will probably be there till 4 and no we will not be shooting all the time as we will have a BBQ and some socializing also. I started getting ready at 7:30 and was ready about 8:40 so just a little behind when I wanted to leave. I was in my car and yes, I needed gas so I stopped to get gas and also ran into Albertsons to pick up some chips and cookies and pop for today. Jan and Lynn are providing hamburgers and I wanted to bring something and I forgot to pick it up last night. Now I do go to the Nail salon by my house and also Starbuck but not Albertson and the reason is I go to Albertsons as my male self but it was early and I normally go in here at night. It was a quick trio in and out as I was worried I would see someone I know, can’t keep my head down like I can at Starbucks. I didn’t see anyone I knew and that was good and soon I was on my way but behind schedule. I got to the range about 9:45 and Jan and Lynn were there setting up. Now the weather today was a mix of everything but snow, we had sun where it was hot out, clouds where it was cold, light rain, heavy rain and even a little hail. Now todays event was from 9:30 till 4 or so and I was wondering how it could go so long although I did come prepared. I brought 2 rifles and 2 handguns including my new one and 200 rounds for each but even that would not last 6 plus hours. Well we got set up and did a little shooting and of course talking and it was fun, by the way my new gun works well. It was a little before noon and Wilma and her wife and daughter showed up so we had 6 of us here today, I was hoping more but it is a drive. It was great to see Wilma again as it has been a couple years. Well it was about 12:30 when we broke for lunch and Jan got out the grill and cooked up some awesome hamburgers, I guess I will have to find something else for dinner tonight at the Escape. We had a great lunch and got a chance to talk and catch up. It was really fun. It really was more about being with friends then the guns and shooting just like when I go to the bars it is about the people I am with that makes it special. After lunch Jan broke out her shot guns and we did a little clay shooting, this is little discs that get shot out and you try and shoot them with shotguns, kind of like bird hunting. Jan, Lynn and Wilma did better than I as they hit some of them. I missed everyone I shot at but it was my first tine shooting this way. Little harder shooting moving targets. It was a lot of fun though. It was amazing how fast the day went and soon it was after 3:30 and it got dark and looked like it was going to really rain so I got my stuff loaded in the car and said my goodbyes and thanked Jan and Lynn for setting this up as it really was fun. Here I brought 4 guns and all that ammunition and only shot 2 of my guns and maybe 100 shots but as I said it really was about being there with my friends. On the way home, I realized I didn’t take a picture and regret it as I don’t have a picture of me shooting a gun, well there is always next year. It was 4:45 when I got home and quickly unloaded my car and touched up my makeup and of course put on heels and I was on my way to the Escape as I wanted to get there early and catch up on my blog from Wednesday night dinner. It was about 5:30 when I got there and ordered some food, breakfast as I was not that hungry but wanted to order something. I ate and wrote my blog from Wednesday as I wanted for others to show up. Rebecca from up by Seattle was the first as she arrived at 7, she had the evening off and drove down just to go out with our group. She usually comes down for Wednesday night dinners but her schedule is a little mixed up right now. It was nice to talk with her as we waited for more to show up. Jan & Lynn were next to arrive, Lynn had her target with her from the shooting range. Her target was a woman being attacked by a Zombie and she almost blew the head off the Zombie and not one shot hot the woman and that was from about 40 feet away, great shooting Lynn. Everyone was coming over to see it and even a couple people took pictures of it. Robyn also showed up so it looked like we might have a good group tonight. It was not real busy but it was still early. Usually 9:30 when Karaoke starts is when it starts getting busy. A little while later Laura M. and her girlfriend showed up as did Narcist and Lauri, even one of our girls stopped by briefly in male mode. It was a good night out for all but a long day. I left home this morning at 8:30am and except for about a 15-minute stop to unload my car and put on heels I was gone all day and evening. It was almost 11 when I called it a day. My makeup held up good all I needed was a little powder throughout the day to keep the shine away. The big win was my lipstick which looked just as good when I got home as it did when I left and that included eating a couple hamburgers at the range (sorry Julie I broke down and had 2 as they were so good) and also eating at the Escape. This is really good lipstick that stays put. It will take baby oil to get it off. 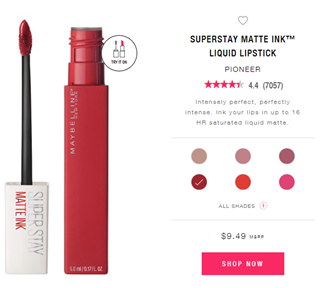 I really recommend it although it is a matte color and it is a little heavier then normal lipstick but other then that it is wonderful. This is the red I was wearing and it is a beautiful color. I also have a few other more neutral colors for when I go out in the day. It was almost 11:30 when I got home, it was a wonderful day out as Susan. Thanks for reading and be sure and see what is new in my life on my most recent blog. It is Wednesday and our group is having their dinner tonight at the Old Spaghetti Factory on the Willamette river in south waterfront of Portland. I am really looking forward to this as it has been a while since I have been there. It is always fun to go to these dinners as not only do I get a night out as Susan but I get to see my wonderful friends and tonight is even better as one of our newer members is going to join us for the first time. Now we are meeting for dinner at 7 but I wanted to be early just in case any of the other girls showed up early. I am not sure how many we will have as I only had l post in the group they would be here tonight. By the way there is still time to sign up for our Mexican Cruise October 13 to 20th 2018. I started getting ready as soon as I got home as I wanted to take my time, I so enjoy the time getting ready and becoming Susan. There is just something so relaxing about the experience. It was just before 6 and I was ready to go, I got to the Spaghetti Factory just before 6:30 and went in and as I figured I was the first one there. Now they were a little busy but the funny thing was it was almost all women coming in, there were a few men in the mix but there were several big groups of women. I checked in and the lady asked me how many we had so I said 6 to 8 and she said that would not be a problem so I gave her my name and sat down and waited for others to show up. Now as I sat there that was when I really noticed how many females were coming in. now don’t get me wrong there were men here but it was just during this time it was almost all woman coming in, one was a big birthday party with about 10 girls. Barb was the first to show up so we talked a little as we waited. Melissa and her wife showed up and then Kimberly. Kimberly is our new member and this was her first time out with our group so I am sure she was a little nervous, not only meeting new people for the first time but being out as Kimberly but she was doing really well. Looking at ger you would think she does this all the time. I keep thinking of my first times out I was so scared and wouldn’t make eye contact with anyone. The fear and excitement were incredible. I don’t have that anymore but now I go pretty much ant place I want and really don’t even think about it. I use to look out every window to make sure no one on my street was out and if they were I would wait and during the summer that could take a while. I remember times I would wait for an hour till it was clear before I would leave my house. These days I just go into the garage and get in the car, open the door and drive out. A few of the times I have opened the garage door before I get in the car so it is going up as I walk to my car. As much as I miss the adrenalin rush it is so much better now as I am free to just be me. Now I am not telling all my neighbors but I am also not hiding it besides as I know 1 of my neighbors know they may all know. Not that the one neighbor who know has told others but as much as I come and go as Susan they had to have seen Susan and may have put it together. It was 7 and they called my name so the 5 of us went in, we had a table on the back side with a good view of the river. Kate texted me she was still at work and wouldn’t make it tonight which was sad but understandable so it would be just the 5 of us tonight. We talked for a little while as we wanted to get to know Kimberly and also let her get to know us a little also. It really can be hard when you are the new girl as you have multiple people to get to know and remember things and we just had her to get to know so it is always a balancing act as you want to get to know them but also don’t want to come on to strong and give them a chance to meld into the group. Well we finally ordered dinner and o got the Chicken Parmesan which is my favorite but really all the food here is wonderful. Now our waitress was awesome and she had the brightest orange nail polish and it really looked good on her so of course had to compliment her on her nails and she thanked me. Actually, several of us complimented her on her nails and she thought that was wonderful as she said really no one else had said anything about them. I guess we just notice nails more but she was flattered by the attention and I think it made her day. She kept coming back to see how we were doing she really was awesome and gave us great service. We had a nice dinner and great conversation and got to know Kimberly better, she is really nice and I hope she will come out with the group more. The night went by so fast and soon it was after 9, where did the time go. These dinners seem to go by so fast, actually all my Susan time seems to go by so fast. We all paid our bills and walked out together. It really is a nice place to go for dinner. I talked a little with Kimberly in the parking lot before we left. It was a wonderful night out. I should have gotten a picture. It was a little after 10 when I got home. Now I am looking forward to Saturday as our group is doing a range day, yes, we will be going to a gun range and shooting guns. Jan and Lynn have done this for several years but this is the first year I have been able to go. Should be a lot of fun. Thanks for reading and be sure and see what’s new in my most recent blog. It is Sunday afternoon and I have some tie free so I am going to Starbucks to catch up on my blogs and then e-mails and if time a little work. For a long time, I would write my blogs the next day and it was almost always at home and I was usually my male self when I did them. But lately I have been trying to do them as Susan somehow it just seems more fitting to write about Susan, about her time out and what she did as Susan. It may seem silly but I feel when I am Susan writing about my time as Susan it is more like I am writing about myself. I don’t really view Susan and my male self as different people as it is still me, still who I am but just more personal this way. So, it will be a Susan day at Starbucks. It was a little after 2 when I got home and started getting ready. Now as I am on my own schedule as I am not meeting anyone or have to be there at a certain time I was free to take my time and enjoy the experience. I really can’t explain why I so enjoy my time getting ready but I do. It was a little after 3 when I was ready and I looked cute and casual which is what I go for when I go out during the day to Starbuck’s, I want to blend in. I got to the Starbucks by my house about 3:15 and went in, they were busy but there was 1 table open by the window so I set my computer on it and went and stood in line to order. Now they have a few new people working here so they don’t know me but as always, they treated me wonderful. I must say I have never had an issue at Starbuck’s with the staff or customers. I got my drink and got my computer out and started my blog for Wednesday nights dinner at Hobo’s. now the one bad thing ab out writing it several days later is remembering what all went on. I also took time to send an e-mail to our group the Rose City T-girls about Wednesday nights dinner this week as I want to see if I can get a bigger turnout. Took me 2 tries as the first time I only sent it to the first 10 members. Luckily, I remembered Cassandras tip that it takes a while for them to go out as it was sent to all 200 members. Last time I did this I kept hitting send as I thought it had froze and it sent it several times. It took about 10 minutes for all of them to go out. Of course, I was writing my blog while it sent. Starbucks is a really relaxing place to go and spend some time and catch up on work or what every you have to do and it is a fun place to people watch too. Now I chose to wear my leggings today with a cute top so I was watching what other females were wearing today. I chose wisely as I would say 60% of the females who came in had on black leggings also. This really is important as I know I don’t pass so if I can match what other females are wearing that is one less thing that stands out about me. 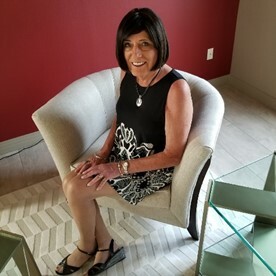 I have been asked many times about passing and the sad thing is most transgenders will not pass 100% of the time all the time, there are always little things that ad up and eventually someone will figure it out. To me passing is able to go out as Susan and have people treat me with respect, the same respect any other female would get. I know the people ate Starbuck’s know I am not female but they always call me Susan or refer to me as She or her and to me that means I have passed. Now there were times it was slow here, at one point I was the only one here and a few people came in and got drinks to go and then some finally sat at the tables. I really think it is easier when they are busy, of there are lots of people here you are not the focus. If you are the only one sitting at a table then everyone notices you. I stayed here till they closed at 6:30 before leaving, on my way out one of the ladies said have a good evening Susan, I love it when they call me by name. I left and went to Costco as I needed gas and then it was time to figure out what I wanted to eat. Now I have been going to Wendy’s but as I had a Hamburger last night I decided to go to Subway and it turns out there is one across the street. I got there and it was pretty slow only to woman there. I ordered my sandwich and sat down and ate it. The 2-woman left and a family of 6 came in but that was it while I was there. It was about 7:30 when I left and went home. It was a good and relaxing few hours. Thanks for reading and be sure and see what I am up to on my most recent blog. It is Saturday and tonight is the Rose Festival Starlight parade so I am not sure how many will be out at the Escape and the downtown area will be packed. But I am still going out. Now I do have to share a funny story, as you all know I have had acrylic nails now for over a year and probably for the last 6 months I have had a clear pink that in certain light does look pinkish. Well really no one has really said anything about them accept for the occasional “you nails look really nice” well yesterday I went and got my hair cut not as Susan as this is a male thing I do as I keep my hair short and it really needed to be done. Well the lady who cuts my hair is really nice and after my hair cut as I was paying her she noticed my nails. Well instead of your nails look nice what she said was wow I really love that color. Now I know there is a slight color to them but this is the first time someone has mentioned the color. I thanked her and then she followed with “you know what would look good you can fade the end into a white, not as much as French tip but a faded one, (name of other lady working there) has the same thing and it looks beautiful although hers are a lot longer”. Now this really caught me off guard as I really would like to do that but as I have seen this nail look and it is pretty, here is a picture of what it looks like but I just smiled and said this was enough for now. Now I must have said it a little fast as she apologized and said she hope she hadn’t offended me and I assured her she had not and it was fine. I guess I was just not prepared for someone to recommend how I could do my nails, next time I will handle it better. Now I am looking forward to my next haircut. Anyway, back to Saturday and it was a busy day as I had things I had to do so it was after 5 when I got home and started getting ready so I will not be there by my usual 5:30. I took my time getting ready even though I knew I was running late and even still I was ready by a little after 6 and on my way. I got to the Escape at 6:30 and as I was waiting for traffic I noticed the parking lot was full so I debated about just going and finding a parking spot on the street but a saw someone come out and get in a car so I was going to luck out. Now there was a lot of traffic and by the time a break came and I could pull into the parking lot 3 cars had left and one more was backing out. I got here at the perfect time and got to park right in front of the door. I went in and all the tables were empty with just a few people at the bar. I sat down at our table and got my computer out and ordered dinner. Now I had only been here a few minutes and Robyn showed up and right after her was Michelle. I talked with Robyn for a little bit and she showed me her heels she had just bought, very cute and high. My dinner came so I ate and Robyn and Michelle ordered the same thing, yes it was a hamburger so if I do go Sunday I will have to find something else. Jan, Lynn, Kearren, Kate and one other girl showed up so we had 8 of us here and it was only a little after 7, this was great. Jan, Lynn and I talked about next Saturday as we are going to a gun range, Jan and Lynn are certified instructors and rent a gun range for the day and invite our members to go and shoot some guns and also give them some training if needed. They have done this for the last 5 years I think but this is the first year I am able to go so I am really looking forward to it. Now I know the bun issue is a hot topic right now but this is not meant to be a political issue it is just some girls getting together for some target practice and a picnic and some girl time with friends. If you like guns you can go if you don’t like them you don’t have to go it is just another group activity. I got to talk with Kearren and Kate a little. Now Wednesday night at Dinner Kate was showing me some of her pictures from Diva Las Vegas and one has me in the background. I kind of think I photo bombed her on this although she is off to one side so maybe she was trying to get both of us in it but it was just such a cute picture I asked her if I could post it on my blog and she said yes. I always like to ask if I can post a picture if others are in it as I think it is the right thing to do. Now there was a smaller crowd here tonight and a lot of them were people I hadn’t seen her before or just don’t remember but it was still fun and everyone was great as always. The Escape really is a great place to go and very excepting of everyone. Son it w as 9 and Karaoke started. It is hard to talk once the singing starts but still fun to listen to and sing along with the songs you know. Now again there were a lot of songs I didn’t know would even say I had never heard before. Is that a sign I am getting old? Lauri showed up at her usual 9:45, I kid her a lot about being our late-night girl but I remember when I never went out till it was dark. I don’t think that is her reason though as I just think she is busy and doesn’t get a chance to get out earlier. I got to talk with her a little also so we had a total of 9 girls out tonight. It was a little after 11 when I called it a night and paid my bill. It is always sad to see the evening come to an end. I am hoping to get to go out Sunday late afternoon and evening for a few hours as I really look forward to my Starbuck’s time and I am now 2 blogs behind, Wednesday night dinner at Hobo’s and now Saturday night. 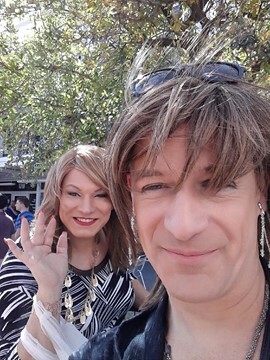 The funny thing is I like going out as Susan to write my blogs but if I always do this I never get caught up as Sunday I will go out and do my blogs for the previous times but then I will need to find time to write my blog about Sunday at Starbucks. I also realize a lot of my blogs may be repetitive in nature as I do and go the same places and I am glad so many people read them which I never thought people would but I really use this to document my time as Susan, my life as Susan, where I go, what I do and who is there, kind of my personal diary which I am happy to share. This is my 1075th blog post which means I have been out as Susan at least that many times. So hard to believe as 10 years ago I was happy if I could get out a couple times a year. I really do owe a lot to my friends that have helped me over the years. Thanks for reading and being part of my life and be sure to keep up with Susan on my most recent blog. It is Monday and I have the day off so Susan gets some time out. Now I am meeting Barb, Melissa and her wife for lunch at 1 pm so I have the whole morning. My plan was to get up early and go to Starbucks for a few hours till the mall opened and then do a little shopping till it was time to meet my friends for lunch. It was the perfect plan for the day or at least I thought. Well things didn’t go as I planned as I got up late so I was behind to start. It was almost 10 by the time I was done with my makeup and getting dressed. Now for today I wanted to ware my corset. Well I had it just about on and as I tightened when you guessed it the ties broke and so I had to take it off and fix it and start over. I got it off and redid the ties and put it back on but was having trouble getting it tight. Turns out I missed one of the eyelets and it just won’t tighten up and so once again off it came and I redid the ties making sure not to miss an eyelet and once more on it went and this time I could get it tightened up. It was now a little after 10 am and I was ready to leave and go have fun. Now I had a choice. I could drive to the mall and have maybe an hour and skip Starbucks or go to Starbucks and have almost 2 hours. Well I needed to do my Blog from Sunday and so Starbucks won out. I got to Starbucks and went in and got a drink and sat down at a table and started on my blog, I really do like the idea of writing my blog as Susan when I am out. It just seems to make the circle complete. Now I had been there about 10 minutes and the same lady I know that I saw yesterday came in again today. What are the odds, again I just kept my head down and kept doing what I was doing. She got her drink and left. I still find it funny that in all the times I have come here I have never seen her here accept for the last 2 days. I stayed here till a little after noon before heading for my lunch with my friends. I got downtown Portland about 12:30 and found a parking spot about a block away from where we were having Lunch, Papa Haydn. Now being the middle of the day, a holiday and a nice warm day outside there were all kinds of people walking the streets and I was just another person out. I went in and got a table and it was only a few minutes later Barb showed up. We talked as we waited for Melissa and her wife to show up, they arrived right at 1 pm. We talked a little mire before ordering lunch. Now the food here at Papa Haydn is good but they have a limited menu. The real reason for going here is their dessert menu, they have awesome desserts. Melissa and her wife split a dessert as did Barb and I. it was so good and so rich. I didn’t even eat half of it. It really was a wonderful lunch and after noon. It was after 2:30 when we finished and all said our goodbyes and left. I got home about 3:30 so I had to rush as I had to be someplace by 4 and in my male mode which I just barely made. It really was a wonderful day. Thanks for reading and be sure and see what is new in Susan’s life on my most recent blog.